When Social Conflict Escalates to Bullying – What Can Parents Do? In a recent article we talked about the work our co-founder and Speech Therapy Director, Mandy Alvarez, does to educate parents, teachers and administrators about the difference between social conflict and bullying. Borrowing from the ideas of Signe Whitson, Mandy highlights the importance of carefully evaluating situations involving social conflict before labeling them as bullying. Here, we’ll talk about true bullying. When true bullying happens it’s important for teachers and administrators to be involved, but there are steps parents can take to deal with it and, more importantly, help prevent it from happening in the first place. Bullying is when a child is repeatedly aggressive, on purpose, towards another child who is viewed as “weaker”. While Mandy stresses the importance of not treating all social conflict as bullying, she acknowledges that true bullying is a serious issue that can have detrimental effects on both the child being bullied and the one doing the bullying. Often, kids who bully lack self-esteem and seek attention and validation through bullying. It is a way to stand out, and feel important, powerful, or popular. They target kids they think they can overpower—kids who are perceived as “different”, get upset easily, or have trouble standing up for themselves. Sometimes bullying is a learned behavior, stemming from growing up in an environment where everyone is angry and shouting all the time. Some kids who bully are copying peers, and some have been bullied themselves. Most kids who bully don’t understand or care about others’ feelings – they need help with perspective-taking, and reading and interpreting non-verbal language. For kids with sensory challenges, their behavior can be misinterpreted as bullying. What Can Parents Do to Prevent their Kids from Bullying? Mandy stresses that the number one thing parents can do to prevent their kids from bullying is to model how to treat others with respect. We can ask ourselves these questions: Do I talk to my partner and others close to me with respect? When my kids see me arguing with someone, do they see me escalate to shouting and name calling? Do they see me work it out? Do I disparage or make fun of people we come into contact with in our day-to-day, like when I am angry at another driver or annoyed by a supermarket worker? None of us is perfect, but our kids look to us for guidance in every way. If we want them to avoid bullying, they need to see us doing our best to treat others and resolve conflicts in respectful ways. What Can Parents Do to Prevent their Kids from Being Bullied? Just as we need to model how to treat others with respect, we also need to model how to deal with people who are aggressive towards us. If someone picks on us or behaves in a rude or mean way, we can show our kids how to stand up for ourselves and get away from the situation before it escalates. Stop bullying from ever happening by steering clear of the aggressor. As much as possible, avoid kids who are mean. If you see them, go in another direction. Don’t give them a chance to bother you. 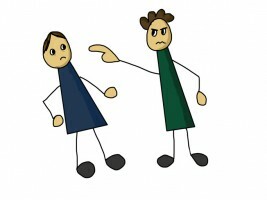 If you can’t avoid the aggressor, don’t give him or her the reaction he or she wants. Kids who bully feel powerful if they know they succeeded at hurting your feelings. If you have a run-in with an aggressor, do your best to not react. Don’t show your feelings or hit, kick, push or say mean things back. Either ignore him or her, or say a simple, “Stop it!” in your bravest voice and get away as quickly as possible. Find a safe place or adult and then if you feel like being upset, go for it. Even if you don’t feel confident, fake it. When you feel afraid, you probably don’t feel very confident. But sometimes just pretending you’re brave is enough to stop someone from bullying you. Straightening your back and holding your head high is powerful nonverbal language that tells a potential aggressor that he or she will not get a reaction out of you. Work on feeling confident for real. Pretending to feel confident might get you out of some tricky situations, but actually feeling confident will make you less of a target. Think about all the things you can do to feel healthy, well-groomed, and successful, and work towards those goals. Get a buddy and be a buddy. There is strength in numbers. If you are being taunted at recess, plan to hang out with a friend during that time. If one of your friends is having trouble, do the same for him or her. If you see someone being bullied, tell the bully to stop and tell an adult. Mandy emphasizes that having a strong, loving bond with our kids is the best way to help them through any challenge. One way to nurture this bond is by establishing a bedtime talk routine. Each night before bed, when neither you nor your child is distracted, lie down with him or her and ask about the day—both the good and challenging things that happened. Listening to your child and engaging in calm, non-judgmental conversation will encourage him or her to open up to you, and create space for you to praise your child’s positive actions and collaborate about challenges and solutions. For more information or to inquire about Mandy presenting her Social Conflict Curriculum at your school, please give us a call!